In our world things get spilled, mixed, combined, blended and emulsified; sometimes by design and sometimes by accident. Direct Separation Solutions provides products and services that help separate the wanted from the unwanted and enhance the recycling and reusing processes. Continuously pumps contaminated fluid from the sump through a chip-blocking pre-filter to the inlet valve. 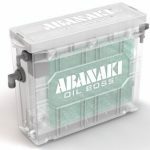 The Oil Boss keeps coolant free of oil and extends tool and coolant life. Direct Separation Solutions, a Canadian company since 2007, provides products and services that help separate the wanted from the unwanted and enhance the recycling and reusing processes.